Lister Cars is a British sports car manufacturer founded by Brian Lister in 1954 in Cambridge, England, which became known for its involvement in motorsport. Sold in 1986, Laurence Pearce produced variants of the Jaguar XJS before producing a bespoke sports car, the Lister Storm. In 2013, Lister Cars was acquired by Lawrence Whittaker's company Warrantywise. Production of the original sports car restarted in 2014 and ten continuation Lister Jaguar Knobblys were built to celebrate Lister’s 60th Anniversary. In 2016 The Lister Motor Company announced the build and sale of The Lister Knobbly Stirling Moss. Beginning in 1954, company manager and racing driver Brian Lister brought out the first in a series of sports cars from a Cambridge iron works. Inspired by Cooper, he used a tubular ladder chassis, de Dion rear axle, and inboard drum brakes. Like others, he used a tuned MG engine and stock gearbox. It made its debut at the British Empire Trophy at Oulton Park in 1954, with former MG pilot Archie Scott Brown at the wheel. Later, Lister swapped in a Moore-tuned Bristol two-litre engine and knockoff wire wheels in place of the MG's discs to improve performance. For the sports car race supporting the 1954 British Grand Prix at Silverstone, Scott Brown won the two-litre class and placed fifth overall behind only works Aston Martins. In 1955, a handful of Lister-Bristols were built with a new body built by an ex-Bristol employee with the aid of a wind tunnel. Despite its new fins and strakes, it was less successful than the original Lister-Bristol of 1954. Lister moved up to a six-cylinder motor from a Formula 2 Maserati A6GCS for their own car, while customers continued to receive the Bristol motor, sold for ₤3900. Lister also attempted single-seater racing with a multi-tube chassis powered by a Coventry-Climax motor and using an MG gearbox, but the car was a failure. For 1957, Lister redesigned the car around a 3.4 litre Jaguar D-type Jaguar D-type XK inline-six, with an aerodynamic aluminium body; it was tested by racing journalist John Bolster, performing a 0–100 mph (0–160 km/h) run in 11.2 seconds. Driver Archie Scott Brown won the 1957 British Empire Trophy in the new Lister-Jaguar. Refined again in 1958, the Lister-Jaguar entered international competitions. Brown was killed that season when he crashed the Lister-Jaguar at Spa-Francorchamps. Lister also developed another single-seater car based on the Lister-Jaguar, for use in the unique Race of Two Worlds at Monza. Cars from this era are affectionately known as the "Lister Knobbly" cars, due to their curved bodywork. For 1959, Lister hired aerodynamicist Frank Costin who produced entirely new bodywork built around a new Chevrolet Corvette powerplant. However, the front-engine layout of the new Lister-Chevrolet was quickly eclipsed by the rear-engine layout of the new Cooper sports car. By the end of 1959, Lister withdrew from competition, although production of sports cars continued for customers. In 1963 Brian Lister was chosen by the Rootes Group to prepare the Sunbeam Tiger for the prototype category of the 24 Hours of Le Mans. The Ford V8-powered Tiger was still in the early stages of development while Lister were constructing the chassis at the Jensen factory. Lister beefed up the suspension and brakes, added an aerodynamic fastback hardtop with a more sloping windscreen and a Kamm tail. The 260 cu in (4,300 cc) Ford V8 engine was tuned by Carroll Shelby to give it 275 hp (205 kW) instead of the stock 160 hp (120 kW). The cars were designed with a top speed of 170 mph (270 km/h), but were developed in too short a time frame and both suffered engine failures. Rootes later received a refund for the engines. The two cars and one prototype mule still exist. The Lister company returned in 1986 as Lister Cars Ltd. based in Leatherhead, Surrey, with engineer Laurence Pearce tuning approximately 90 Jaguar XJSs, improving their capable top speed to over 200 mph and with an asking price of over £100,000. Success at this endeavour led the company to design a new sports racer, the Lister Storm. Launched in 1993, it would use the largest V12 engine ever fitted to a production road car up to that time, a 7.0 L Jaguar unit. 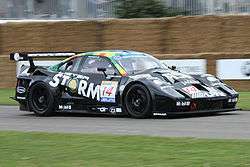 The Storm was later developed for motorsport in various guises, winning the FIA GT Championship in 2000. Lister later developed a bespoked Le Mans Prototype, the Storm LMP in 2003. Brian Lister died in December 2014 aged 88. In 2012 Lawrence Whittaker and his father visited the Lister factory to source parts when restoring a Lister Knobbly, and the opportunity to purchase the Lister Motor Company arose. In 2013, ownership of George Lister Engineering Limited of Cambridge, original intellectual property rights, the plans and drawings for all original Listers, as well as the property rights of Pearce's Lister Cars were bought by father and son team Andrew and Lawrence Whittaker, who also own car warranty company Warrantywise. The new company, along with its associated components, was rebranded as the Lister Motor Company Ltd. Ten months later, the Lister Motor Company announced the build and sale of the Lister Knobbly to mark 60 years since the first Lister Racing Car was built. The new company started building of the original Lister designs in 2014. To celebrate the 60th Anniversary of The Lister Motor Company, the release of the Lister Knobbly was announced, described as the most successful racing car of the late 1950s. The Lister Knobbly was driven by some of the most notable racing car drivers of the 50s including: Archie Scott Brown, Stirling Moss, Ivor Beaub, Bruce Halford and Innes Ireland amongst many others. Within a matter of weeks half of the 60th Anniversary Lister race cars were sold out. Soon after, the order book was completely full and Lister had orders for £5m. In June 2016 The Lister Motor Company announced the build and sale of the Lister Knobbly Stirling Moss at the Royal Automobile Club in London. The car is built to the exact specification of the 1958 model, and is the only magnesium-bodied car in the world, and only the second car in history endorsed by legendary racing driver Sir Stirling Moss . Brian Lister invited Sir Stirling Moss to drive for Lister on three separate occasions, at Goodwood in 1954, Silverstone in 1958 and at Sebring in 1959,  and to celebrate these races, 10 special edition lightweight Lister Knobbly cars are being built and priced at £1 Million each. The company announced that the cars will be available for both road and race use, and Sir Stirling Moss will personally be handing over each car. ↑ Page, James (17 December 2014). "RIP Brian Lister 1926-2014". Classic and Sports Car. Retrieved 17 December 2014. ↑ "Mystery Monday: Lister Motor Company CEO – Brian Lister's Engineering Passion Runs Through Everything We Do". Goodwood. 16 May 2016. Retrieved 24 September 2016. ↑ "Lister Storm Brewing". Motorsport Magazine. 12 November 2013. Retrieved 1 September 2016. ↑ "Lister is back". Autoweek. 19 September 2013. Retrieved 23 September 2016. ↑ "Lister Cars to return". Auto Express. 19 September 2013. Retrieved 29 July 2014. ↑ "New Lister Knobbly Launched". EVO. 23 January 2014. Retrieved 21 September 2016. ↑ "Lister sports cars set to return after surprise Cambridge find". BBC News. 23 September 2013. Retrieved 29 July 2014. ↑ "Knobbly 2.0: One of History's Most Stunning Race Cars Is Reborn". Wired. 30 January 2014. Retrieved 16 September 2016. ↑ "Lister Press Page". 28 June 2016. Retrieved 12 September 2016. ↑ "Half of 60th anniversary Lister Jaguars sold out". Autoweek. 19 January 2014. Retrieved 1 May 2016. ↑ "Meet Lister's £1 million Stirling Moss special edition Knobbly". 28 June 2016. Retrieved 11 June 2016. 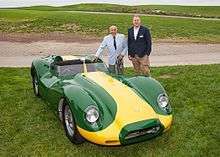 ↑ "Lister Jaguar Knobbly Stirling Moss Editions on sale for £1 million". 28 June 2016. Retrieved 23 September 2016. ↑ "Limited remake: the Lister Jaguar Knobby Stirling Moss". 30 June 2016. Retrieved 23 September 2016. ↑ "Announcing the Lister Stirling Moss". 28 June 2016. Retrieved 11 July 2016. Wikimedia Commons has media related to Lister Cars.